The role of a Medical Administrator involves all the duties of an office Administrator, with the specialism of the medical industry. The role primarily involves providing administrative support to medical staff, and depending on where you work, you may also be the first point of contact for patients – a role that requires tact, discretion and understanding, so no laughing at embarrassing illnesses. This role may not be based within GP surgeries or medical centres, but also within hospitals, prisons and schools. There are also some relevant qualifications within the industry that may be required, and these are detailed below. The application process is usually the submission of your CV and cover letter to the recruitment department. This will then be followed by an interview, and possibly a trial to see if the role is suitable to you. There is some studying and qualifications required for this role. Most employers will look for at least four GCSEs (A -C grades, including English). 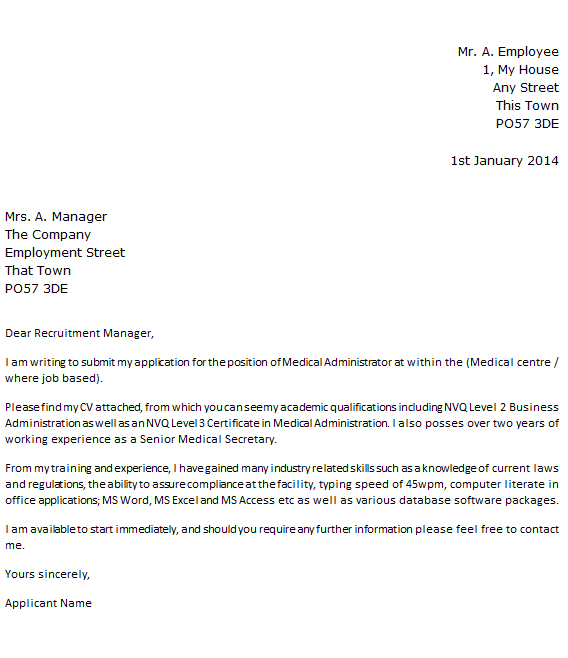 I am writing to submit my application for the position of Medical Administrator at within the (Medical centre / where job based). Please find my CV attached, from which you can see my academic qualifications including NVQ Level 2 Business Administration as well as an NVQ Level 3 Certificate in Medical Administration. I also posses over two years of working experience as a Senior Medical Secretary. From my training and experience, I have gained many industry related skills such as a knowledge of current laws and regulations, the ability to assure compliance at the facility, typing speed of 45wpm, computer literate in office applications; MS Word, MS Excel and MS Access etc as well as various database software packages.